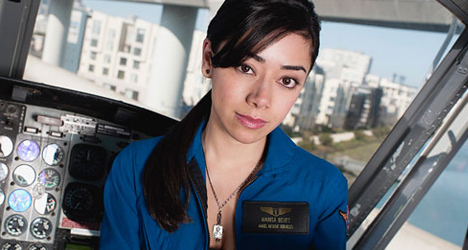 Actress Aimee Garcia stars as Ella López, a forensic scientist for the LAPD, in "Lucifer." 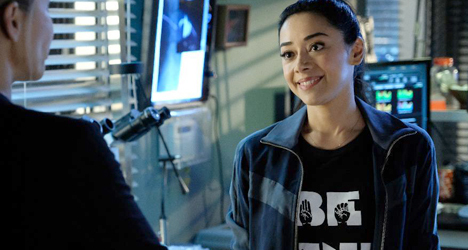 We’re 10 episodes into the third season of “Lucifer,” Fox’s drama-fantasy-comedy series featuring the Devil (Tom Ellis) working as a police consultant and nightclub owner, and one of the highlights of the show has been the performance of Mexican-Puerto Rican actress Aimee Garcia and the development of her character Ella López, a forensic scientist for the LAPD. Since joining the cast as a regular last season, Garcia’s role as Ella has expanded into her biggest since her three-season turn on the hit Showtime series “Dexter” where she played the title character’s nanny Jamie Batista. In the nine episodes that have aired so far this season, audiences have learned (spoiler alert) that she is a geeky fangirl, has been banned by a casino in Las Vegas for counting cards and hears voices in her head. Garcia’s role will continue to grow this season and feature her in what she calls an “Ella-heavy episode” in late January. “I can’t think of another character in any sort of media who is like her,” Garcia, 39, told me during an interview last week. During our interview with Garcia, who also had TV roles on “George Lopez” and “Trauma,” we talked about finding a steady gig on TV again, how she felt seeing Latina fans of the show dress up like her character at comic cons and about an extremely interesting meeting she had with other Latinas in Hollywood in Eva Longoria’s living room. “Lucifer” airs Mondays at 8pm on Fox. What has it been like watching yourself in Season 3? The writer of the episode usually hosts a viewing party. If we’re not shooting anything, we all try to get together and support each other and watch it. I love watching my fellow cast members. They’re great and funny and heartbreaking. I love watching them do their thing. I try to be pretty objective [on myself]. I’ll watch myself and be like, “Ah, that could’ve landed a little better.” Or I’ll watch and be like, “Ah, that was funny!” I’m not a tortured artist. How does it feel now that you’ve found a home on TV like you’ve had in the past? It’s nice. We have such a fervent fan base. We always hold steady. We beat higher profile shows. It’s nice to have a family. I’ve been at Warner Bros. since “George Lopez.” It’s been a home away from home for me. I feel super lucky to work in L.A. [The “Lucifer” cast] get along so authentically. I hope it radiates through the screen. Because we have that chemistry and camaraderie, we really want each other to shine. It’s a complete joy to come to work. 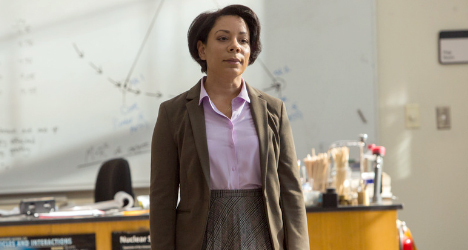 What is it like portraying a Latina scientist on TV? When I signed on [in Season 2], I knew [Ella] was a woman of faith and of science. That was enough of a nugget for me to dig into. She a scientist and I love representing Latina scientists. Someone mentioned to me that Ella López is the only Latina scientist on TV right now. For me, she should be one of hundreds. But that was special to me – to be a professional Latina scientist who is a woman of faith and science and working with the Devil. That was enough for me to jump on board. Since then, we’ve learned so much more about her. Every time I open up a script, I’m learning something different about Ella. She’s really fun and smart, but she can also get ghetto. She’s full of surprises. That’s what makes her so fun to play. I think, by far, Ella has been one of my favorite characters ever. Is there something specific that makes your character special? I love that she doesn’t lead with her sexuality. She doesn’t even have a love interest. How many female characters on TV don’t have a love interest? She’s in her own lane. That’s why I think the fans really latch onto her, especially the Latina fans. One of the most touching things I experienced at comic con was seeing young Latinas and dress up like Ella. They could’ve dressed up like Harley Quinn or Wonder Woman or other superheroes who can stop planes or plunge into oceans, but they decided to wear glasses and a top knot and carry a scientific toolbox. They were dressing up like Ella López because they thought she was that cool and interesting. That completely warmed my heart. People are very affected by what they see. If what they see on TV is a professional Latina scientist who is not self-conscious and not defined by a man, then sign me up! What other Latinas in the industry inspire you? Who is doing good work right now? America Ferrera’s [NBC sitcom] “Superstore” is funny. She is a producer of the show. Gina Rodriguez (“Jane the Virgin”) is winning awards left and right. Gloria Calderón is creating shows like “One Day at a Time.” We actually all got together recently as Latinas. [The meeting] was spearheaded by Eva Longoria (“Telenovela”) and America and Gina. They got us all together – Rosario Dawson (“Sin City”), Zoe Saldana (“Guardians of the Galaxy”), Gloria [Calderón], Justina Machado (“One Day at a Time”), Jackie Cruz (“Orange is the New Black”). It was 25 Latinas in Eva Longoria’s living room talking about how we as Latinas have so much power to create content and to change the landscape. So what happened? What came out of that meeting? Do you all have a plan now to change the landscape? We thought, “Oh my God, with all of our Instagrams and Twitters combined, we could reach 100 million people! That is a lot of power!” It was such an inspiring group to be a part of. We heard each other’s stories and I thought, “Wow, if we all go to each other’s movies and promote each other’s films, there’s nothing we can’t do.” I feel like I’m part of a growing movement of strong Latinas. It’s a new era and a very exciting one. I think it’s one that is not going to be just a chapter, but a permanent change. They brought up a good point during the first meeting that if anyone has any content, they can take it to the various women in that room who have production companies. Gloria [Calderón] said that anyone who has a story to tell should become a content creator. If something is successful and headlined by a Latina, then they’re going to want to make more. We want to help mobilize that and move it forward. What’s the next step? Is this going to be something you do every month?